As the interest in traditional tablets approaches the freezing point, hardware manufacturers are putting their money on 2-in-1 laptops. 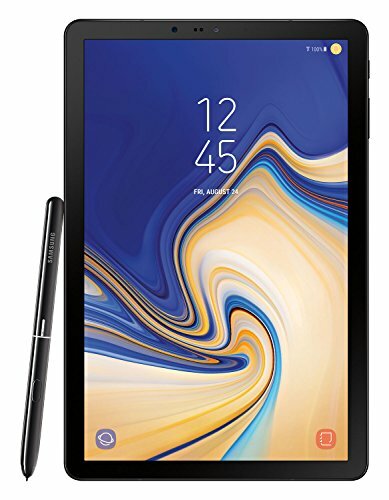 Microsoft has recently released a new version of the Surface Pro (start at $899), and we’re curious to know how the latest hybrid laptop-tablet device with the Windows operating system does against the Galaxy Tab S4 from Samsung (starts at $649.99), arguably the best 2-in-1 with Android. For the first time, the Surface Pro 6 is available in black, and we have to say that the new color option suits it well. You can also get it in platinum, making the available color options feel somewhat limited compared with the broad palette of Microsoft’s colorful styles of the past few years. The Galaxy Tab 4 is available in black and gray. The tablet remains true to Samsung’s glass-and-metal approach, giving it a very elegant look. The massive slab of glass on both the front and back sides makes it significantly more fragile compared with the Surface Pro 6, but that’s the price you have to pay for the level of elegance and sophistication Samsung aims for. The Surface Pro 6 has a built-in kickstand that makes it easy to work and play virtually anywhere. You can adjust the built-in kickstand for the perfectly titled writing and drawing position. 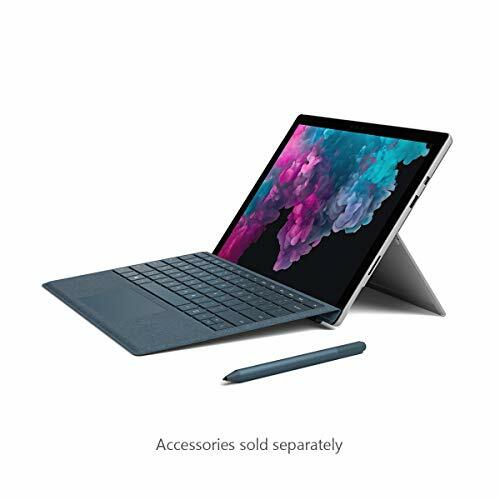 The kickstand also plays an important role when you add the Type Cover keyboard dock and essentially transform the Surface Pro 6 from tablet to laptop. The Galaxy Tab 4 doesn’t have a built-in kickstand. It relies solely on the Samsung Book Keyboard Cover. Unfortunately, the keyboard looks and feels nowhere near as polished as the tablet itself. Its layout is cramped, which is something that cannot be said about Microsoft’s Type Cover keyboard, and it isn’t backlit. Microsoft has been generous with ports. 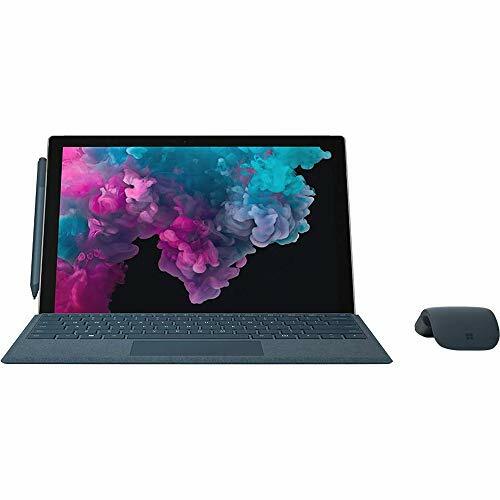 The Surface Pro 6 has a single USB-A 3.0 port, a mini DisplayPort port, and a microSD card reader along with the 3.5mm headphone jack and power supply connection. Surprisingly, there isn’t a single USB Type-C port anywhere on the device, but, at least, Microsoft has released a Surface Connect to USB Type-C Adapter. The Galaxy Tab 4 has a USB Type-C port and a headphone jack on its bottom side and a Pogo connector for the optional keyboard cover on the left side. To maintain portability, tablets typically have displays that measure less than 10 inches. Laptops, on the other hand, have displays that measure 13 inches or more to allow for comfortable multitasking. Microsoft has decided to strike a balance with the Surface Pro 6, going with a 12.3-inch display with a resolution of 2736 x 1824 and an aspect ratio of 3:2. The Galaxy Tab S4 has a 10.5-inch Super AMOLED display with extremely vivid colors and eye-melting brightness. The display has a resolution of 2560 x 1600, and its amazing sharpness comes to life when watching 4K videos or playing games. Both displays reproduce colors with impeccable accuracy, and they are suitable for professional graphics designers and photographs. The Surface Pro 6 covers approximately 90.2 percent of the sRGB gamut, while the Galaxy Tab S4 produces an amazing 219 percent of the same gamut. Even though you can’t expect a mobile CPU to match the performance of a full-fledged desktop CPU (at least not yet), the Galaxy Tab 4 holds up great against the Surface Pro 6. Its Snapdragon 835 CPU and 4GB of RAM provide a solid amount of speed for multitasking, allowing you to watch a YouTube video in Full HD while browsing the web with multiple tabs open at the same time. The Surface Pro 6 features Intel Kaby Lake processors, which are known for their energy-efficient quad-core processing power. Microsoft sells the 2-in-1 device with either 8 GB or 16 GB of RAM, and all models are equipped with the Intel UHD Graphics 620 integrated graphics card. According to Microsoft, the Surface Pro 6 should last 13 hours 30 minutes when playing a looped video, but real-world tests show that it lasts an hour or so less than that. The Galaxy Tab 4 lasts around 9 hours 30 minutes on the Laptop Mag Battery Test (web surfing at 150 nits). The main selling point of the Galaxy Tab 4 is the built-in DeX software, which adds a desktop interface on top of the Android operating system and provides second-screen capabilities. DeX certainly looks like a real desktop operating system, with a familiar taskbar and an app tray, but it feels like a work-in-progress next to the Surface Pro 6 and its Windows 10 Home. There’s no trackpad on the optional Galaxy Tab S4 keyboard cover, which wouldn’t be such a huge issue if the user interface was more touch-friendly. Unfortunately, it isn’t, and the S Pen doesn’t save the day. DeX works best with an Android-compatible mouse, which makes familiar gestures like drag and drop much easier. The Surface Pro 6 feels like a regular Windows laptop. Some apps work great with touch, but most are best enjoyed with the trackpad that’s built into the Type Cover keyboard. You can also interact with the device using the Surface Pen, an active stylus and digital pen developed by Microsoft for its series of Surface computing devices. Samsung deserves praise for its attempt to make Android work as a desktop operating system with DeX. Eventually, we think the company will get there, but it will likely take a few more iterations. If you want a 2-in-1 device that can serve you as a laptop during the day and entertain you in the bed when you go back from work, the Surface Pro 6 with its Windows 10 Home operating system is a better choice.